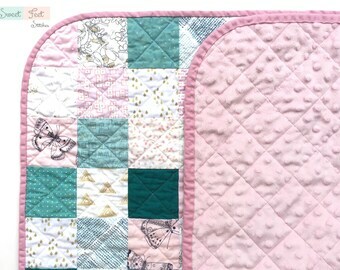 Announcement Discover a handmade quilt that your child will make memories with for years to come! 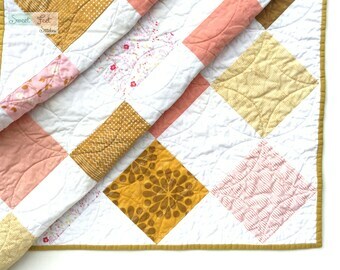 Or shop for quilt patterns, and make your own beautiful heirloom quilt. There are both ready to ship and custom quilts listed in my shop. Don't see what you're looking for? Send me a convo, and we can discuss your quilt vision! For coupon codes and upcoming sale information follow along on Facebook. Discover a handmade quilt that your child will make memories with for years to come! 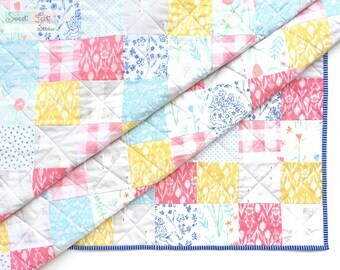 Or shop for quilt patterns, and make your own beautiful heirloom quilt. 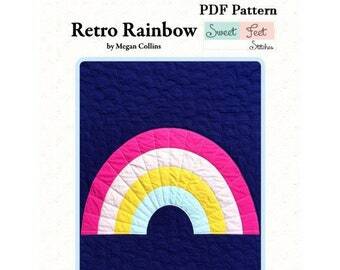 Wonderful pattern that comes together to make a fun and beautiful rainbow. Highly recommend! All quilts and patterns are in sale through Sunday! Everything in the shop is 20% off through Sunday! 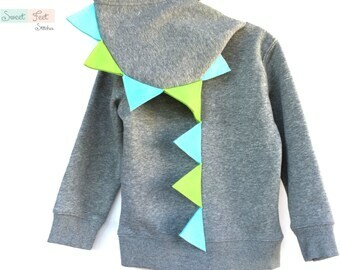 Clearance sale on all remaining dinosaur hoodies in the shop! Come check it out! A sweet baby girl quilt. Dinosaur hoodie in the wild. Hello! Welcome to Sweet Feet Stitches! Before kids, I was a teacher and used each summer vacation to learn a new skill. One summer I painted (my husband was not always a fan of my ‘artwork’), and another summer I taught myself to quilt. Needless to say, the quilting stuck…the painting, not so much. Since then, I’ve used most of my spare time to quilt and design. Quilting has become my stress reliever and passion in a life ruled by the chaos of two little boys and a new baby girl. 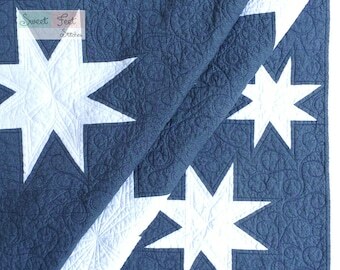 I used only high quality 100% cotton fabrics in my quilts. Your quilt will be made with materials that not only make a difference in how the quilt feels, but also in how well it stands the test of time. 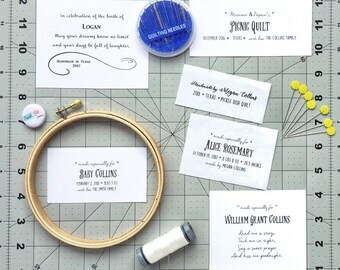 You can find my washing suggestions here: https://www.etsy.com/shop/SweetFeetStitches/policy?ref=shopinfo_policies_leftnav. Obviously, babies and toddlers make messes. Quality materials mean less wear and tear despite the many washings the quilt will endure. If you buy a quilt from me, whether already completed or a custom request, each quilt has received/will receive my full dedication and attention to detail. Each quilt is handmade with care and is a unique, and usually, one of a kind item. I finish up each quilt by hand sewing the binding along the back of the quilt. To me, this is the perfect finishing touch for a handmade quilt. I am a stay-at-home mom, and avid quilter. Nine years ago, I taught myself to quilt. Since then, I’ve used most of my spare time to quilt, and design. It’s my passion in a life ruled by the whims of three small children. Welcome to Sweet Feet Stitches! I believe in making high quality handmade goods for you to take home and love. I hope you enjoy visiting the shop! All sales are final. I am available during business hours to answer questions, and will respond as quickly as I am able. Please ask sizing, shipping, and design questions before purchasing your item. Items ship within 1-2 business days of order and payment. Shipping prices are listed on each item. If you order more than one item, shipping charges may be combined, and the difference will be refunded. Feel free to contact me before ordering if you have questions. Quilts will be shipped USPS priority mail. These usually arrive within 2 days of being shipped. It is the policy of the USPS to offer a tracking number with both priority mail and first class packages, which I will send with your shipping notification. If you would like insurance on your package or faster delivery, please let me know before you order, and I will adjust shipping costs accordingly. The PDF quilt patterns found in the shop will be emailed to you after purchase! Washing/Care Instructions will be sent with your quilt. All quilts are washed in ‘free and clear’ detergent after being made. This produces the wrinkle effect that you see in the pictures. Do not iron minky material. *Spot clean. When washing is necessary, wash with the sweatshirt turned inside out and zipped up. Wash cold. Turn right side out and lay spikes flat to dry. Felt does pill over time & wool felt does shrink some - you can use a cool iron or very low heat to maintain shape. 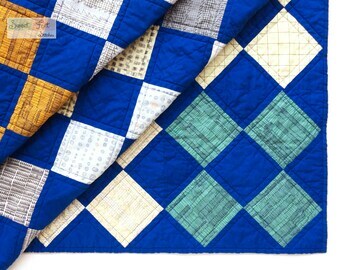 Your quilt is a handmade product from Sweet Feet Stitches. This means it was made by my hand, and hours of personal attention went into making it just right. As such, each quilt is a unique item, even differing from other quilts in my shop made with the same pattern. The differences in each are what give them the character that makes them so lovable. Enjoy!